Car and Driver calls it "one of the best-looking van bodies ever plopped atop four wheels." And it's true: the Chrysler Pacifica has changed what it means to be a minivan. What's in store? 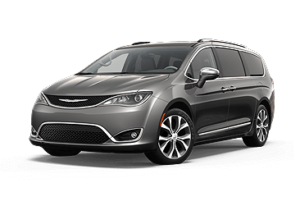 The Pacifica offers slightly more space than its Town & Country counterpart:about an inch wider, and roughly half an inch taller. When it comes to mobility vehicles, every inch counts. The interior styling is reminiscent of a Chrysler 300 sedan, and the luxurious two-tone leather and wood accents will make both driver and passengers feel pampered. But aside from style, the Pacifica boasts better handling and noise control, which is big news when paired with BraunAbility's Quiet Drive™ system. Standard on every BraunAbility vehicle, Quiet Drive provides a 25% noise reduction inside the cabin of the vehicle. Couple that with a new Pacifica platform with "class-leading ride, handing, and noise, vibration and harshness," and the BraunAbility Pacifica promises to be the best driving experience on the market. 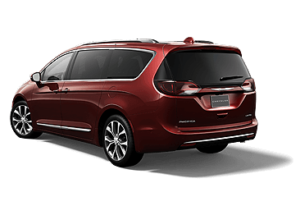 The Chrysler Pacifica also comes with great technology, almost mandatory in this age, with UConnect, a second row entertainment system filled with games and perfect for long car rides. Chrysler is also working to make a hands-free door option not just for the rear tailgate, but for the sliding doors on either side available as well. Now caregivers and chair users can operate the door/ramp/kneel system entirely by passing a foot (or footrest) beneath the frame of the van. And for anyone wanting to extend that new car look as long as possible, the Pacifica comes with a Stow n Vac, making quick clean-ups convenient and easy. BraunAbility loves this feature because the best way to keep your mobility equipment performing for years is to keep it clean and free of debris! A panoramic sunroof and rear park assist with stop technology are the cherries on top of the cake. BraunAbility is very excited to introduce you to our Pacifica, but that won't happen until we're 100% sure we have the best product ready for our customers. After all, we didn't become the most trusted name in mobility by rushing product out the door. If you'd like to stay in-the-know on all things BraunAbility Pacifica, sign up for updates here!